Day three and we move back into the K-Pop sphere with an article written by one third of the K-Pop dance cover group ZISSPop (check them out on YouTube) who also happens to be my sister. Also, a quick note: Unfortunately tomorrow I won’t have the means to post anything, so Guest Week will technically go on one day longer this time around. Hello, all. I am Krispy, sibling of Vagrantesque. Some of you may know me from ‘ZISSpop’, my K-Pop dance cover group. I have a special interest in both dance and Korean culture, so K-Pop is sort of my forte, given that it includes a generous portion of both. The following article details what – in my opinion – have been some of the best and worst decisions in the Korean Pop Music genre thus far. This includes relevant factors such as fashion, music taste, choreography, skill and group dynamic; not just music. If you know nothing about K-Pop, you probably won’t really know what I’m talking about, but feel free to give it a read anyway. I tried to choose and rank these objectively (which meant getting rid of all my bias’ and fan-girl conceived opinions). The result was quite a lengthy and detailed analysis of various components within K-Pop. If you do not agree, I hope that you can at least enjoy! The following article represents my opinion only. I am not trying to say that my opinion is the way to go, nor am I trying to claim that mine is the only one that matters, nor that I am the best. Although a lot of the following information is factual, my opinion is not fact. I do welcome your opinions, but please don’t bully me. Ty. 7. Doing a second ‘Growl’ clip. 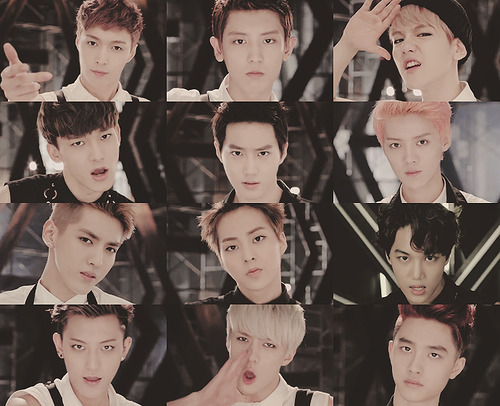 A collection of EXO’s close ups in the 2nd video for ‘Growl’. Look, do I want to be that guy who complains about seeing extra EXO footage? No. But it just seems to me that SM’s second rendition of EXO’s Growl was a touch unnecessary. The first video had already gone viral because of how unique it was, with its smooth camera work, its complex choreography and the fact that it was (supposedly) all filmed in one single take. So why would you divert people from that? (Inb4 ‘fan-service’ and ‘for the money’). Don’t get me wrong, I love EXO as much as the next guy (probably a little more than the next guy), but to me they just take the simple first video and jazz it up, add some special effects, put a little more makeup on the blokes and force them to repeat the choreo in front of a snazzy background (and without the 360 degree camera action that made the first video unforgettable!) Call me old fashioned, but I am just a fan of some good dancing, and EXO showed a new level of skill in that first Growl clip that will set them apart from other K-Pop groups for the foreseeable future (even if only for that shot of Kai dropping his hat and then swiftly picking it up and stepping back into the choreo without blinking an eye).